Simply put, Acid Extra Ordinary Larry Maduro is a beast of a smoke. Its big-ring 6x60 size allows for an enormous amount of smoke to pass through the cigar, delivering tons of that distinct Acid Purple flavor along with the classic chocolate and coffee notes of a maduro-wrapped cigar. When you light up an Acid Extra Ordinary Larry Maduro you can safely expect a wild array of flavors, including but not limited to rich coffee, chocolate, floral tones, and blackberry sweetness. I love these cigars. expensive, yes - so I wait for a deal, which is what I got. If you want a cigar with a mix of flavor this is the one a full body cigar with no after taste just sweet aroma. Great cigar when relaxing or watching a event on TV. Great infused cigar love sweetness. 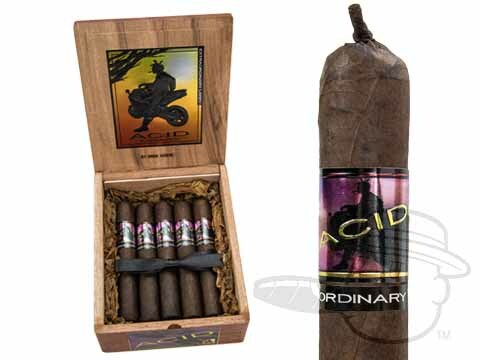 Acid Extra Ordinary Larry Maduro is rated 4.5 out of 5 based on 9 customer ratings.